This sweet but sad tale is set during World War I. In just 60 pages, you learn how Rosalie is dealing with her father’s absence. He’s a soldier away on duty. She sits in back of the classroom and plans her own mission. Meanwhile, her mother works long hours to support the war efforts. The consequences are great for both of them. Told in first person through Rosalie’s eyes, the text is frequently broken up with charming illustrations that give deeper meaning to the story. Read it to yourself or as a read aloud. The tale brings understanding to those who have never had a loved one fighting for a cause in a far away place. Captain Rosalie is a beautiful effort and a book you will want to share. While her father is at war, five-year-old Rosalie is a captain on her own secret mission. She wears the disguise of a little girl and tracks her progress in a secret notebook. Some evenings, Rosalie’s mother reads aloud Father’s letters from the front lines, so that Rosalie knows he is thinking of her and looking forward to the end of the war and to finally coming home. But one day a letter comes that her mother doesn’t read to her, and Rosalie knows her mission must soon come to an end. Author Timothée de Fombelle reveals the true consequence of war through the experiences of small, determined Rosalie, while acclaimed artist Isabelle Arsenault illustrates Rosalie’s story in muted grays marked with soft spots of color — the orange flame of Rosalie’s hair, the pale pink of a scarf, the deep blue ink of her father’s letters. All the more captivating for the simplicity with which it is drawn and told, this quiet tale will stay with the reader long after its last page is turned. Timothee de Fombelle was born in the heart of Paris in 1973, but often accompanied his architect father on his travels to Africa. Each summer his family left for the countryside (the west of France), where the five brothers and sisters lived like wild horses, making huts in the trees, playing in the river and losing themselves in the woods. In the evening they performed plays for their parents and devoured the books in the library. Childhood remains for him the lost paradise which he re-discovers through writing. After becoming a literature teacher, Timothee taught in Paris and Vietnam before choosing the bohemian life of the theatre. Author of a dozen plays, he writes, designs, builds sets and directs the actress he admires the most, his wife Laetitia. They have a young daughter, Jeanne Elisha, who already loves climbing trees. Toby Alone was his first novel and has been translated into 22 languages. He has since written its sequel, Toby Alone and the Secrets of the Tree, and the Vango series. Isabelle Arsenault is an internationally renowned children’s book illustrator whose work has won many awards and much praise from critics. Her books include the graphic novels Jane, the Fox and Me and Louis Undercover by Fanny Britt, Spork and Virginia Wolf by Kyo Maclear, Cloth Lullaby by Amy Novesky (Bologna Ragazzi Award 2017) and Colette’s Lost Pet, which marks her debut as an author. She has won the prestigious Governor General’s Award for Children’s Literature three times, and two of her picture books were named as New York Times Best Illustrated Books of the Year. The poetry expressed through Isabelle Arsenault’s graphic universe, the gentle flow of her lines and the overall charm of her books have made her one of Quebec’s best-known and esteemed illustrators. 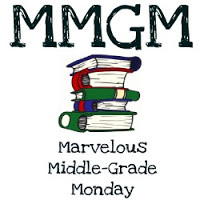 (Make sure you put MMGM or Marvelous Middle Grade Monday in the subject line so it gets sorted accurately–and please don’t forget to say what book you’re featuring) You MUST email me your link by Sunday evening (11 PM Eastern Time) in order to be included in the list of links for the coming Monday. This entry was posted in Middle Grade Book Reviews and tagged Captain Rosalie, Isabelle Arsenault, Timothee De Fombelle. Bookmark the permalink. Will have to check this book out! The story sounds like a heart breaker. I love the cover as it engages the reader immediately. I will have to order a copy. My great grandfather was in a similar situation as his father went off to war. Thanks for the review. I would have bought this one on the cover alone. It is charming. Thanks for telling me about it.